Elaine May, Michael Cera, Lucas Hedges and Joan Allen star in Kenneth Lonergan's Pultizer-nominated work. 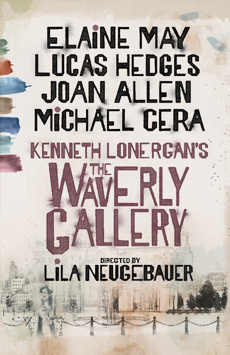 Iconic actor, comedian, writer, and director Elaine May returns to Broadway for the first time in 50 years in Academy Award® winner Kenneth Lonergan’s acclaimed memory play, The Waverly Gallery. A powerfully poignant and often hilarious play, The Waverly Gallery is about the final years of a generous, chatty, and feisty grandmother’s final battle against Alzheimer’s disease. Gladys is an old-school lefty and social activist and longtime owner of a small art gallery in Greenwich Village. The play explores her fight to retain her independence and the subsequent effect of her decline on her family, especially her grandson. 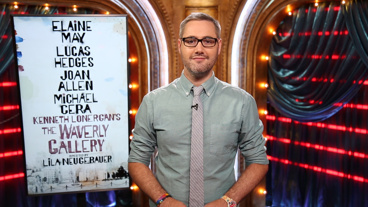 More than a memory play, The Waverly Gallery captures the humor and strength of a family in the face of crisis. Directed by Drama Desk and Obie Award winner Lila Neugebauer (in her Broadway debut), the cast includes Grammy Award winner, and Academy and Golden Globe Award nominee, Elaine May, one half of the legendary comedy duo, Nichols and May, whose landmark show An Evening With Mike Nichols and Elaine May famously played the John Golden Theatre; Academy Award nominee Lucas Hedges; Tony Award® winner Joan Allen; and, in his third Lonergan play, Michael Cera.